When we named our middle daughter Melissa, we didn't really know what it meant. We just liked how it sounded. Later, however, we found out that Melissa is a Greek name, meaning honey bee. (Alternatively, it means red rose in Persian). Melissa is the feminine version of the name of a legendary King of Crete, Melisseus. In Greek myth, Melissa is also the name of a princess of Crete who was turned into a honey bee after learning how to collect honey. 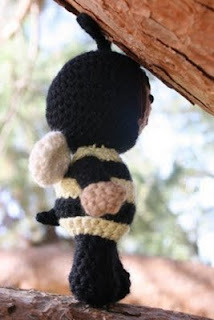 So perhaps it is not surprising that Mel had a slight bumble bee collecting fetish when she was younger. 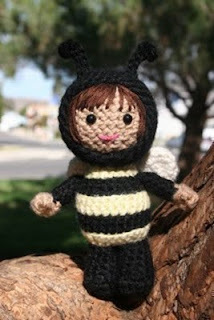 The first bee related thing I made her was the Melissa jumper partially pictured above complete with hand embroidered bees. 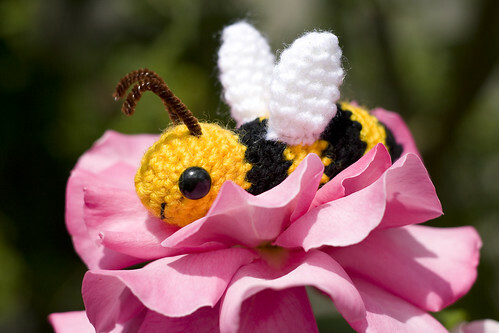 (I like the little bee instead of a dot on the 'i'). (Even though this little jumper hasn't fitted Melissa in about 10 years, it is still carefully stored in the precious potential knitted heirloom box. One day, I might turn it into a cushion). 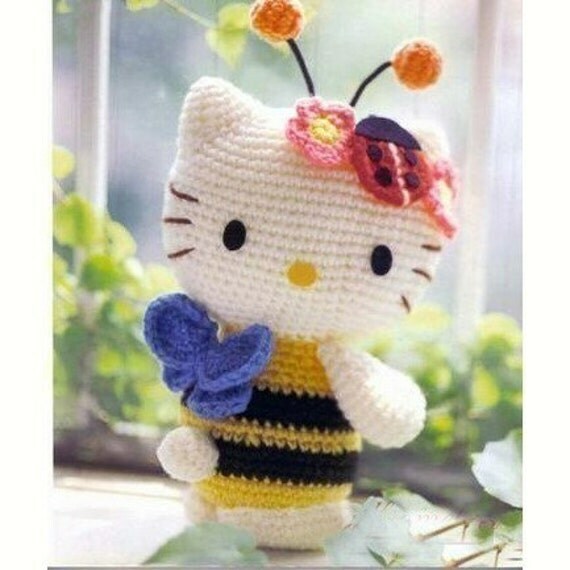 Hello Kitty in a bee suit complete with bugs and butterflies. Mel is also a Hello Kitty fan. So I eventually decided it was going to be something in a bee suit. So here is a Bear in a Bee Suit. The basic bear body comes from a pattern from Debbie Bliss. (In fact, it is the same basic bear as the ballerina bear from last post). The head, arms, legs and ears are knitted using an eight-ply acrylic multi-dyed yarn on 2.75 mm needles. 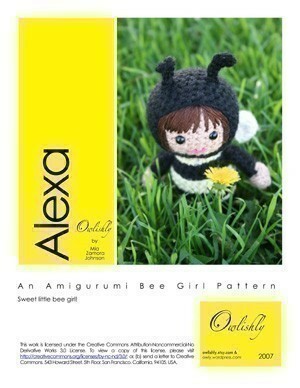 The body is knitted in stripes of yellow and black. I designed the hood so that it can be pulled up over the teddy's ears or left loose. It is only attached at the neck edge. The antenna are made from tightly rolled knitted strips with tiny knitted woolen balls at their tips. The bears body is fully movable with jointed arms and legs. For his photo shoot, the bear decided to pose in my garden with the emerging spring bulbs. Possibly someone should mow the lawn! Hi, I saw the hello kitty pinned on pinterest and it said there was a free pattern, so I was wondering if you know of any free pattern for that Hello Kitty?? Please help me out!